Remember taking a first aid course through school or the scouts? I can still remember parts of my 7th grade first aid class. Some of the things I recall were important, but others … not so much. Deciding when to call 911 (very important! ), wrapping bandages (sort of important), and learning the surprising fact that the best treatment for hypothermia might involve taking off wet clothes (maybe important, but I have not had to put this to use, thankfully). One thing I recall vividly being of utmost importance: Be prepared. Getting trained is a great first step. If you’re a bit rusty on the essentials, check out the Red Cross First Aid Training site here . Beyond getting trained, being prepared for an emergency also means being equipped. That’s where an Individual First Aid Kit (IFAK) comes in. The IFAK (pronounced eye fack) has military roots. According to Military.com, since 2002 more than 900,000 soldiers, sailors, and marines have carried IFAKs in the field. I first found out about the concept from my friend and former Army Ranger Ray Jula. Ray went through the Tactical Combat Casualty Care (TCCC) course and used IFAKs in the field. He also walks the talk in civilian life; every time I see Ray he’s got a backpack or a shoulder bag with him, full of life-saving equipment. Most commercially available IFAKs tend toward tactical. They are often palm-sized pouches in desert-like colors (think Flat Dark Earth or OD Green), with MOLLE straps so they can be securely attached to a larger pack. Typically IFAKs have a tourniquet, an ACE bandage and something to stop bleeding (a “hemostatic agent”) – but, you can expand the list of what is in your IFAK based on your specific needs. Why would this battle-proven gear be of interest to you, Dear Reader? I will answer with an analogy. Just as many folks have opted to keep fire extinguishers in their homes and offices in case fires break out, the people who carry IFAKs are preparing themselves in case they encounter situations where they or a loved one needs first aid. The fact that soldiers think IFAKs are useful is just further evidence in favor of carrying one – if an IFAK holds the tools to help with some of the worst trauma of war, then it can certainly help with the emergencies that will come up in our hunts, hikes and homes. If you want to DIY your own IFAK, then JKR. The first thing you need are the first aid ingredients, you know, the items that you might need most in an emergency. What constitutes an emergency is up to you. Perhaps the threshold is a “bleeding event” or perhaps simply being “hangry” is an emergency. 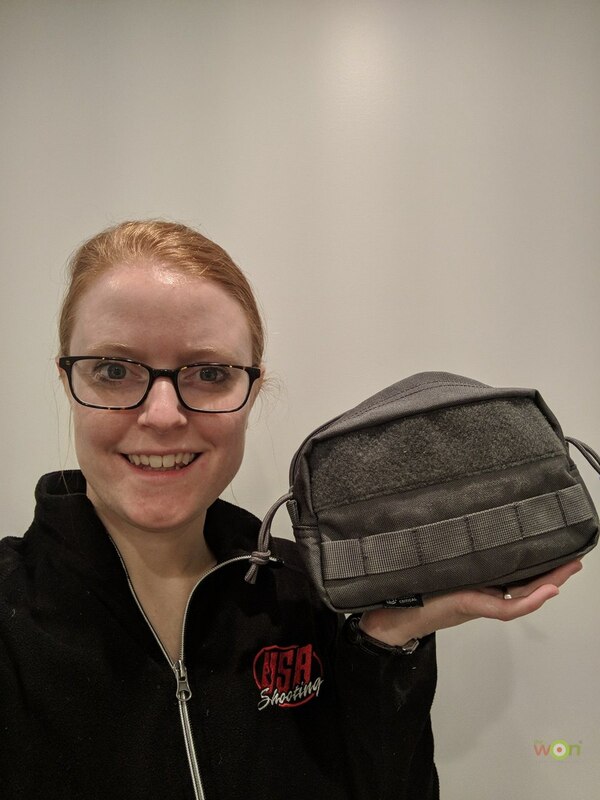 For the former, the IFAK would need items like an ACE bandage, Band-Aids, acetaminophen or ibuprofen, and maybe even a “space blanket” for the chance of a hypothermic event. For the latter, those hangry emergencies, it might make sense to include a snack that will last for a while, like a dry granola bar. Next, you need a bag. Any bag will do, as long as it fits the items you picked out in the first step. There are benefits to making the IFAK convenient to carry with you, so aim for something that fits into a bag you take everywhere, such as a purse or a range bag. Honestly, even a Ziploc bag will do, as long as you remember to bring that IFAK with you. 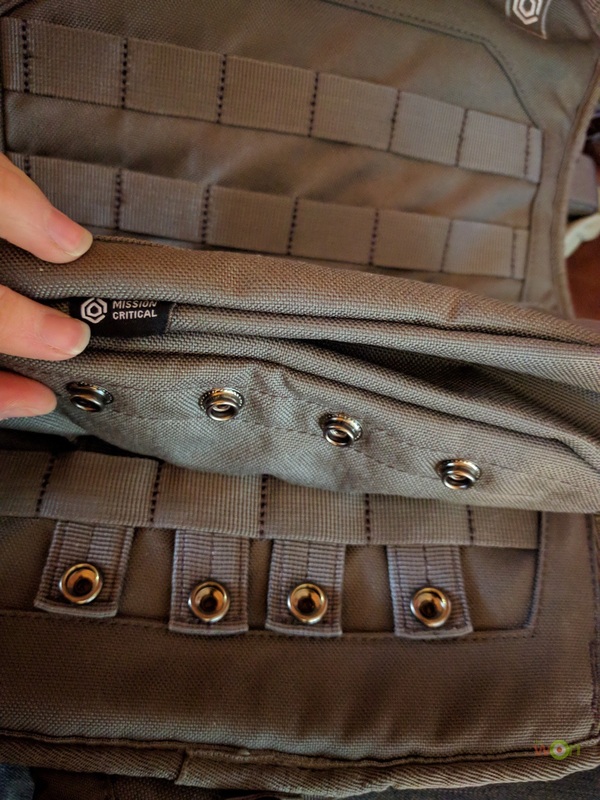 I built my own basic Mom IFAK (MIFAK?) to keep in my son’s diaper bag. 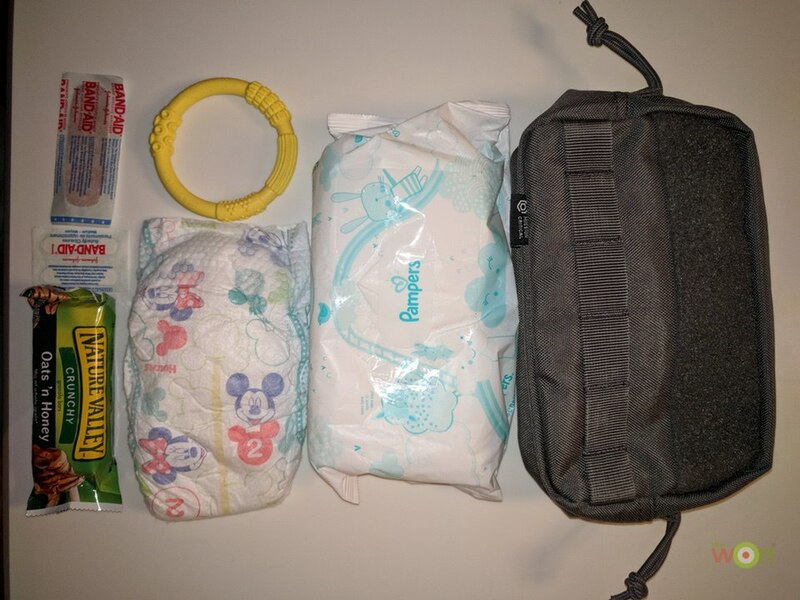 I kept it simple so that I will know where everything is in the pouch. If I need to add more in the future, there is plenty of room in the pouch for additional items. The bag I used is the Rectangle Pouch from Mission Critical. I picked this one because it matches the Mission Critical Baby Carrier we already use. 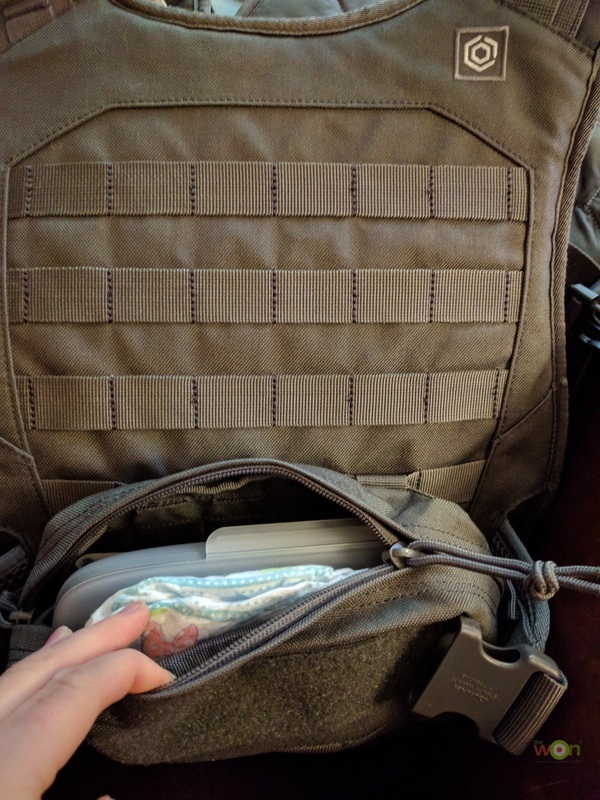 It easily straps to the carrier using the MOLLE system, and it is compact enough to slip into the backpack we use as a diaper bag. In my IFAK I included Band-Aids, wipes, a diaper, a granola bar and a small teething toy. While only some of these things are “first aid” related, some of them are super useful in a pinch. If we are out and about and my son scratches himself, I will be able to put an adhesive bandage on the cut, calm him with the teething toy, and calm myself with the granola bar. At the very least, having this gear with me helps me feel more prepared and less likely to panic when/if the tears start to fall. Now to complete this intro to IFAKs, let’s end with another fire-related analogy. Your smoke detectors are a valuable tool to warn you of fire in your home. But those smoke detectors will not work if the batteries are dead, or worse, if the smoke detectors are not installed at all. Just like a smoke detector, your IFAK will serve you well when you need it, as long as you bring it with you and keep all the items inside it up to date. If anything you include in your IFAK has an expiration date, like acetaminophen, then make sure you switch it out to keep it fresh and usable. A lot of smartphones and calendars have reminder features for this very thing. If you make your own IFAK, we would love to see it! Share it with the hashtag #WONIFAK so we can all see it and cheer on your emergency preparedness. Check out my next article to see IFAKs taken to the next level. 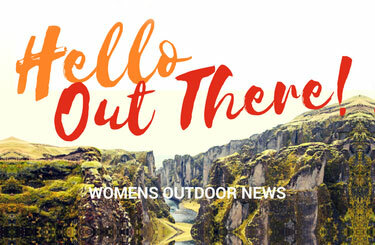 I will feature some of Ray’s recommendations and specific items for hiking, shooting, and hunting.